While it’s obvious that vendors are biased (or proud) about products they invent themselves, we do think we should toot our horn on this one. Since Christmas Eve of last year, the day the software was released, we have had thousands of customers convert to the next version. The challenge we had in creating this latest release was to add useful functionality and benefits our clients wanted without losing the most important reason people use the system. It’s simplicity! This did not come without some cost. Over the course of 2 years we carefully designed features and functions that would be both flexible and easy to use. The iteration was demanding and at times painful. In the first time in our history, the more powerful product, TaskMap Professional has outsold TaskMap Standard edition, proof positive that simplicity and power do not have to be mutually exclusive in software design. 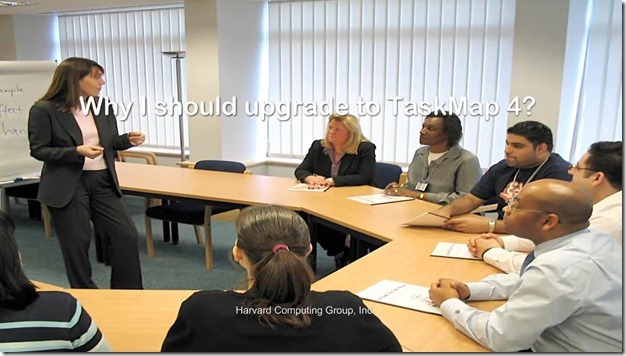 If you haven’t taken a look at TaskMap 4 then please take a look at this short (66 seconds) video and see what we mean. Click here or on the picture below. Reasons to upgrade are outlined in this short video.